Just a short update, to mention my observation of a Norwegian Lesser Black-backed gull at the Zwin-nature reserve near Knokke. The bird was ringed black JH77, and although it was ringed in 2006, this is the first observation. After the observation of J1LT at Le Portel last month, this is my second Norwegian bird this autumn, and my 6th in total (two of which I saw in Morocco, so only my 4th in Western Europe!). 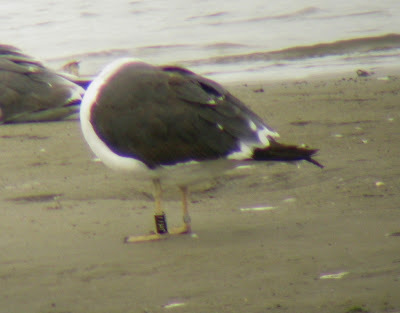 LBBG black JH77 (N Lorentzen), ringed in 2006, and now observed for the first time.